We all know the buzzwords “crowd-sourcing” and “big data” and how these terms reference the power that comes from massively aggregating data or people to allow something to happen that could not have happened in smaller quantities. Microsoft’s Exchange Online platform really highlights the power of this concept when it comes to getting a handle on malicious or spam e-mail. Once upon a time, when your users got a spam e-mail or phising attack, they might classify the e-mail as such and send it to the Junk e-mail folder; and as an Exchangae administrator, you might have tried to modify rules in your Exchange server to block these kinds of e-mails. But now that millions of e-mails are flowing throw Microsoft’s data centers, Microsoft can monitor user and administrator activity in real time to detect malicious patterns. For example, if 1,000 people classify the same e-mail as spam over the course of an hour, Microsoft can figure out that “hey, this is spam”, or if an IP address issuing e-mails gets repeatedly flagged by users as spam, Microsoft can take action against that IP address for all Exchange Online users immediately. As an Exchange administrator, there’s no need to download any sort of list on a regular basis full of updated rules. The change is real-time and immediate. This kind of service is available through something called Advanced Threat Protection which is available as an “a la cart” service (which can be paired even with on-premises Exchange implementations) or with E5 subscriptions. However, Microsoft has just announced that anti-spoofing protection will now be rolled out to all Exchange Online users. This is great news for the majority of our clients who are using their E3 subscriptions. This is one more way Microsoft can protect your information from unauthorized phising attacks. Read more about Microsoft’s anti-spoofing protection as well as Microsoft’s Advanced Threat Protection service. 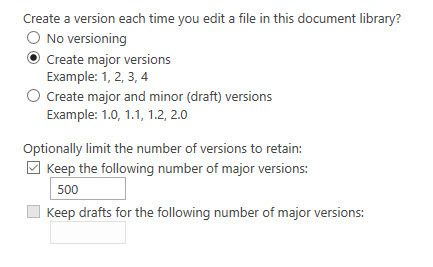 Starting at the end of September, users will no longer be allowed to turn off versioning in document libraries and the minimum number of versions to retain is set to 100. Versioning is already enabled by default, but it’s possible for users to disable versioning. In the olden days, when SharePoint was on-premises and you were responsible for paying for your own database storage for documents stored in SharePoint, it sometimes behooved you to be a bit stingy with versioning in document libraries, since versioned documents could quickly balloon the size of your content database. However, storage is cheap now and it honestly makes more sense to err on the side of document recoverability than on skimping on storage. You can read more about this update in the roadmap.